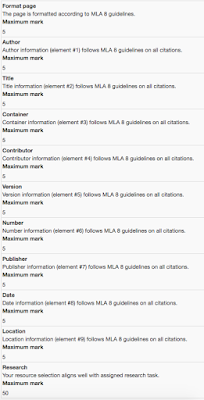 On the surface, one would think that creating a list of consulted resources is a mechanical, lower-order thinking task, but creating citations involves resource evaluation. 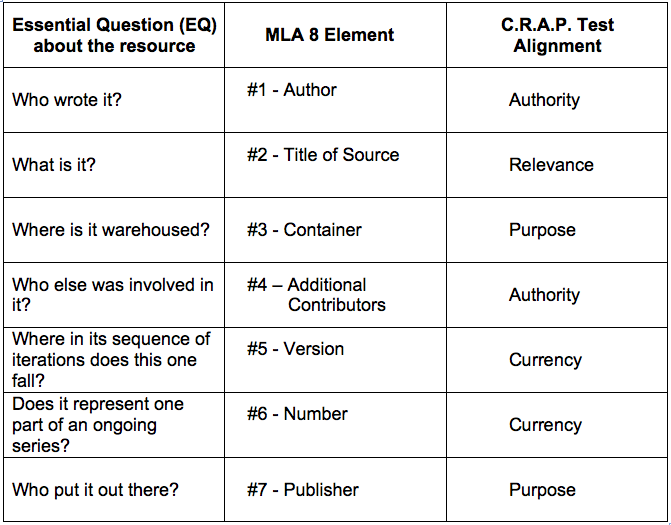 The chart below cross-walks Essential Questions (EQs) with the nine Modern Language Association (MLA 8) elements of a citation, and the widely used C.R.A.P. 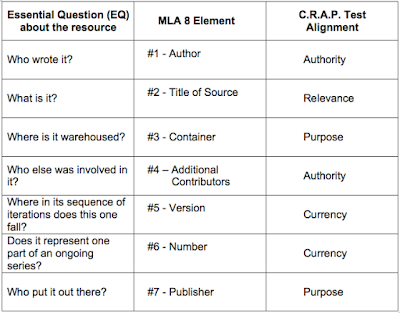 Test (Currency, Relevance, Authority, Purpose). 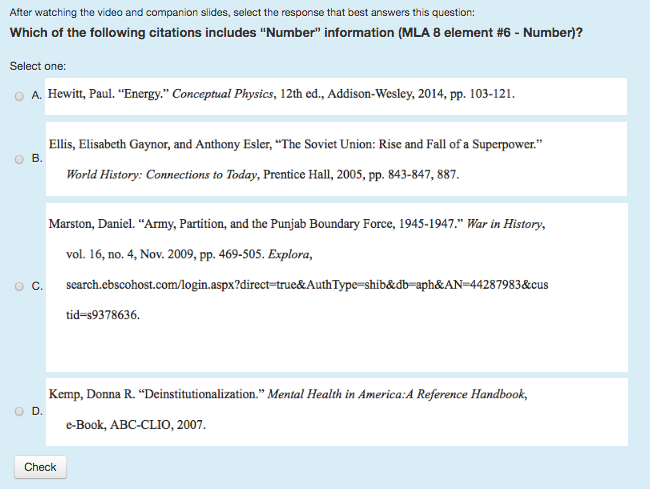 The citation seldom helps learners evaluate the accuracy of their source, but it does tell them something about currency, relevance, authority, and purpose. Creating a citation will not help researchers evaluate a resource as a stand-alone activity, but it will help learners think more analytically about what they are consulting. 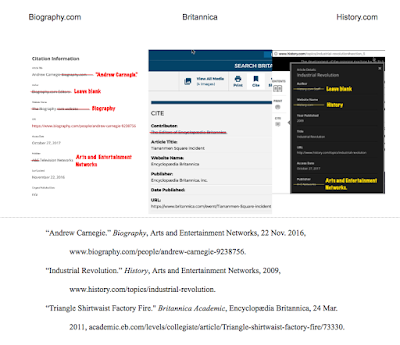 Learning, practicing, and perfecting research documentation habituates students to reviewing author bios, reading "About" pages, checking dates, and deconstructing URLs. This goes a long way toward sharpening students’ skepticism – a disposition that serves researchers brilliantly. 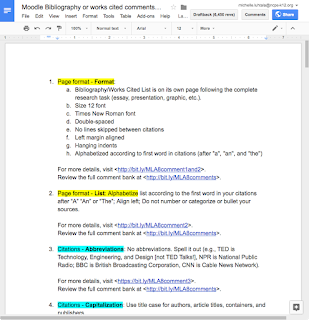 Back in October, we introduced a new strategy to teach all students in grades 9-11 how to create a bibliography following the new Modern Language Association's guidelines (MLA 8). This has been a year long process. Each week, we think of new ways to improve the system. Digital badges work! 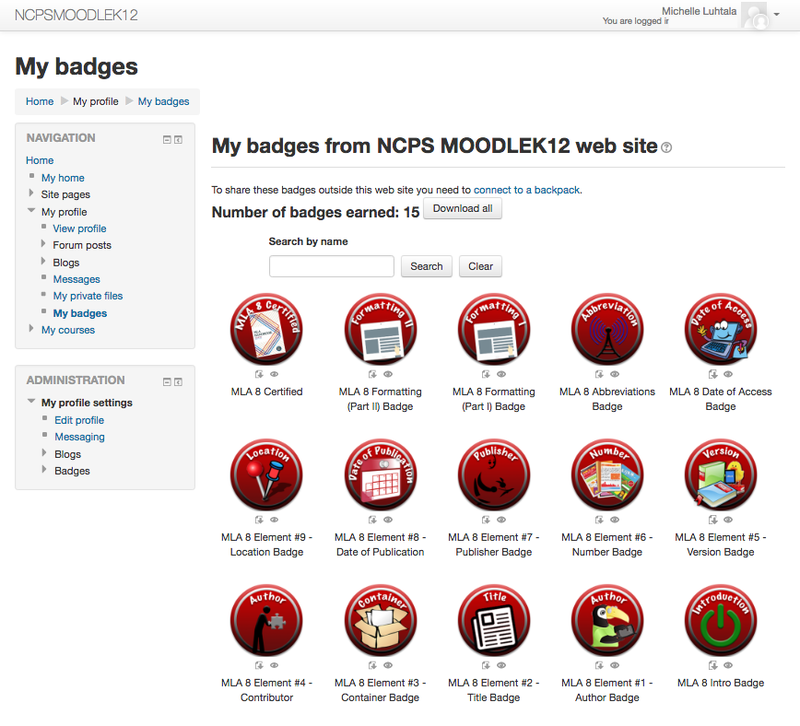 If we'd known the degree to which digital badging would incentivize learning, we would have introduced them ages ago. 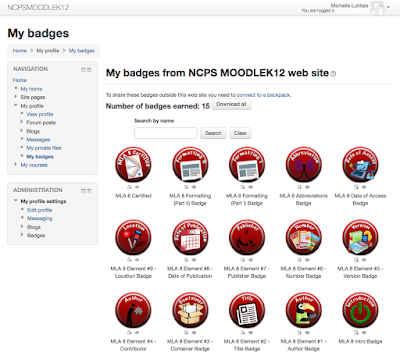 In our last post on this topic, we were just about to launch a digital badging program in the library Moodle. Moodle is one of the high school's current learning management systems. 15 Digital Badges Earn 1 IRL Badge! When students click the "check" button, feedback appears. Correct responses generate validation feedback, whereas incorrect responses generate additional instruction on that concept. Students may re-attempt each quiz as many as three times. 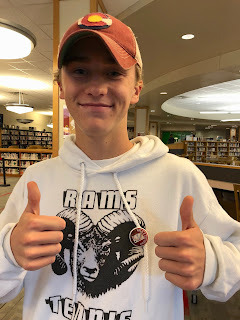 When a student's quiz score meets the established criteria, he/she is issued a digital badge. This is automated, so it occurs instantly. When class meets again, students should theoretically have 14 badges. Then, one of the librarians administers a 10-15 minute quiz in class. A score of 75 or higher will earn students their fifteenth badge. 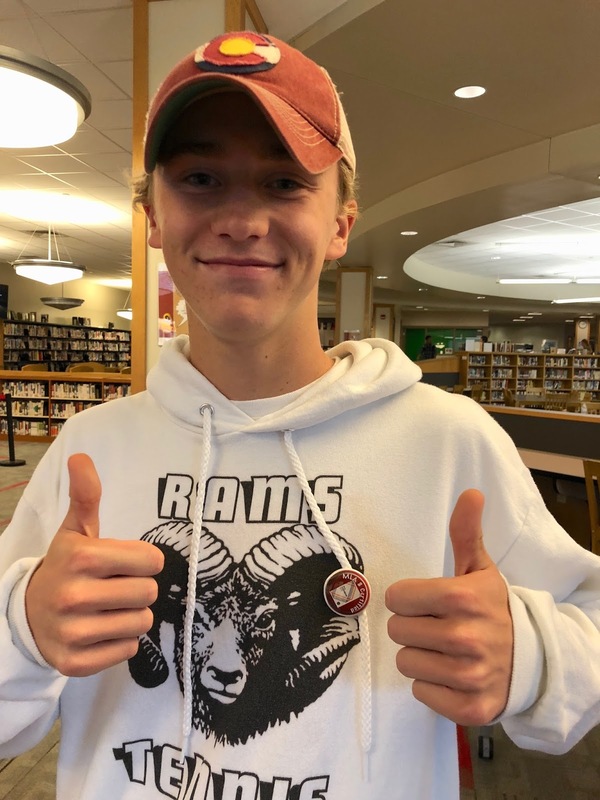 Nearly 400 students have taken this quiz since October 17, 2017. 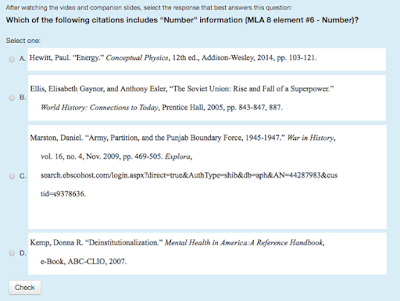 We encourage students to submit their bibliographies to the library Moodle for feedback. In fact, many teachers require it. 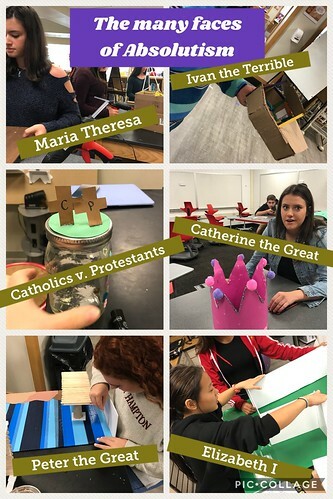 In a recent analysis of 65 bibliographies, we learned that the program is effective in improving student learning outcomes. The table above features data for three ninth grade history classes. This is brand new learning for these students. They have never created bibliographies from scratch before. 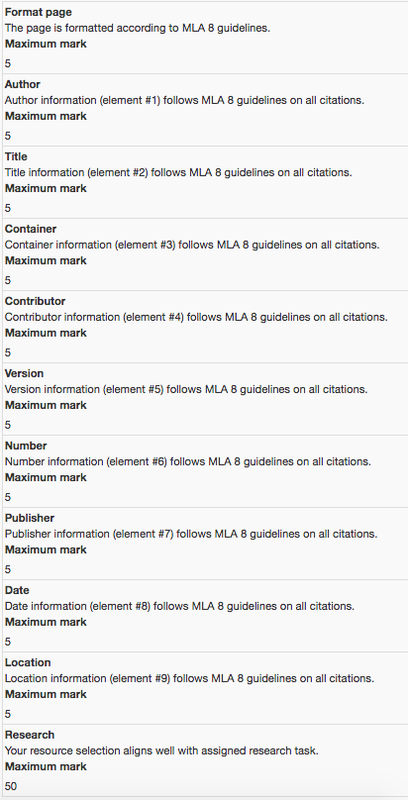 In middle school, they relied on EasyBib, an online citation generator, to do this work for them. The learning curve is steep and it will require many tries and much practice before the process feels seamless to them. Given that context, a 60% success rate is excellent this early in the school year. While we did not collect data last year, anecdotal feedback from teachers assures us that we are on the right track. We embedded a comment bank to support learners and teach them how to improve their work. We had one last year, but we streamlined it by cutting to half as many comments. The list is embedded below. Because this list is embedded in Moodle, we can click relevant comments into each of the ten grading criteria fields to personalize feedback. This not only helps students understand what they got wrong, but how to fix it, and for those who need further explanation, each comment includes a link to examples, such as the one below.